Has Osteopathy helped you? Do you value your local Osteopath? 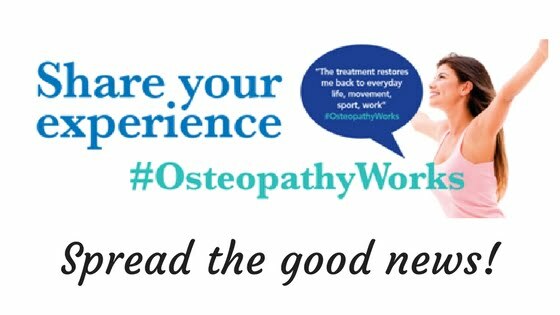 Do you have a positive experience to share?#OsteopathyWorks is a national campaign to raise awareness about how Osteopaths can help people of all ages improve their health by asking you to tell us all about how Osteopathy has worked for you. The idea is the brainchild of Gilly Woodhouse. Gilly became a passionate champion for Osteopathy after treatment helped her young son Toby through major illness and surgery over a period of several years. She began to work in promoting and marketing osteopathic CPD courses and that’s when she realised that Osteopathy is not well known to the general public. So she began to address this problem firstly by coaching Osteopaths in marketing themselves and secondly by finding ways to raise public awareness. You see, Osteopaths tend to be very good at helping people get better but they are often a bit rubbish at marketing. This means that people who could benefit from treatment simply don’t know that it is an option. Most Osteopaths get their new patients by recommendation from previous patients who are delighted with their experience and spread the word to friends and family. Gilly’s simple but brilliant idea was to open this up on a larger scale, so that people who wanted to sing the praises of their osteopath could do that on a more public platform. The Institute of Osteopathy states that current research shows that 96% of osteopathic patients say they have confidence in osteopathic treatment and advice. A further 80% of patients describe their osteopathic care as very good, while 85% described the experience as very good. So they have embraced this idea too and are publicising the #OsteopathyWorks hashtag. Anyone can use the hashtag in a tweet, or in a social media post. Thus a searchable body of information gradually builds up which is informative and useful for people who want to know more about Osteopathy, or people who stumble upon it and don’t know much about it. Have a look for yourself – google #OsteopathyWorks, or search on your favourite social media platform. You will already find a wealth of information – why not add your own story?